Install and maintain smoke and CO detectors per code requirements. A disabled smoke detector cannot save your life! Home escape plan: If fire breaks out in your home, you have to get out fast! With your family, plan two ways out of every room. Fire escape routes must not include elevators which may actually take you right to the fire. Choose a meeting place outside where everyone will gather. Once you are out, stay out! At least twice a year, have the whole family practice the escape plan. Space heaters safety: Keep portable and space heaters at least three feet (one meter) from anything that can burn. Never leave heaters on when you leave home or go to bed; be sure to keep children and pets well away from them. Cigarette smoking increases fire risks: Carelessly discarded cigarettes are the leading cause of fire deaths in the United States. Never smoke in bed or when you are drowsy! Provide large, deep ashtrays for smokers and put water on cigarette butts before discarding them. Before going to bed, check under and around sofa cushions for smoldering cigarettes. Be careful while cooking: Never leave cooking products unattended. Keep cooking areas clear of combustibles and wear short- or tight-fitting sleeves when you cook. Keep the handles of your pots turned inward so the pots can't be knocked or pulled over. If grease catches fire, carefully slide a lid over the pan to smother the flames, then turn off the burner. Never put foil or other metals in a microwave oven. Matches and lighters are tools: In the hands of a child, matches and lighters are deadly. Store them up high where kids cannot reach them, preferably in a locked cabinet. Teach your children at a young age t that matches and lighters are tools for adults, not toys for kids. If children find matches or lighters, they should tell a grown-up immediately. Use electricity safely: If an appliance emits smokes or has an unusual smell, unplug it immediately and have it repaired or replaced. Replace any electrical cord that is cracked or frayed. Don't overload extension cords or run them underneath rugs or carpeting. Do not tamper with the fuse box or use improperly sized fuses. Stop, drop, and roll: Everyone should know this rule and technique. If your clothes catch fire, do NOT run! Stop where you are, drop to the ground, cover your face with your hands to protect your face and lungs, and roll over and over to smother the flames. Crawl low under smoke: Smoke is dangerous! If you encounter smoke, use an alternate escape route. If you must exit through smoke, the cleanest air will be several inches off the floor. Crawl on your hands and knees to avoid the more dangerous smoke and make your way on the floor to the nearest safe exit. 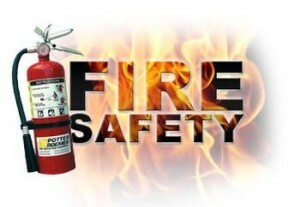 For additional information about fire safety, please contact the Gloucester Fire Department a 978-325-5300.